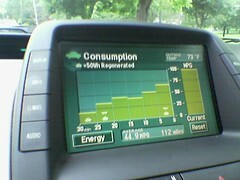 On July 4, 2005 I drove away with my new 2005 Toyota Prius Hybrid vehicle. I'm ecstatic. The car is great. I actually look forward to commuting. I'm sure that effect will wear off shortly. But until it does, I'm enjoying the ride. The following is my initial review of the car and some of its components. I'm working on developing a repository of all my experiences, gathered tips & tricks, and lifetime average, instantaneous, and graphed MPG efficiency. 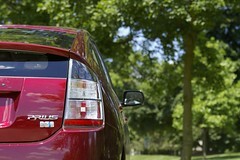 The heart of the Prius is the HSD - Hybrid Synergy Drive. It is a combination of a 72 hp, 1.5 liter, 4-cylinder gasoline engine, a 67 hp, 295 lb.-ft electric drive motor, a 27 hp eletric traction motor, regenerative brakes, and a pretty slick CVT (continuosly variable transmission) powertrain and system that combines to form a 110 hp combined engine which gets: 60 mpg - City, 51 mpg - Highway, 55 mpg - Combined (EPA Testing). Did you catch that? The Prius has higher city mileage than highway mileage. This is thanks to increased use of the efficient electric motor and electric energy recovery using a regenerative braking system. And contrary to what many people initially believe you do not plug the Prius into the wall. You drive it normally. Well, you fill it with gas, but then you drive better to get better mileage. So, how does the HSD actually play out in the car? Driving at slow speeds is a little... odd. The car is nearly silent. In fact, the loudest sound you hear are the tires on the pavement. This is because the electric motor is driving the car. As you accelerate higher, or require more power in general at a higher speed, the gasoline engine, or ICE (Internal Combustion Engine), will start up to provide more power. Overall, acceleration feels good. It's not a sports car, but it's not a golf-cart or Cadillac either. The car will take off the line like most cars (its light, which helps as well). Furthermore, handling is great, and the car feels great with just the electric motor. When you pull up to a stop sign, light or traffic, the ICE shuts off. What this means to you is, it sounds and feels like your car has stalled. However, when you press the accelerator pedal, the car takes right back off. No more feeling like your body is being constantly jiggled while sitting waiting for the light to change. Your car is quiet and still. It's very relaxing. Honestly. While the Prius looks small, it is not small. Categorically it is a MidSize Sedan. It is 4-door with a hatchback. There is plenty of room for both the front-seat and back-seat passengers. Tall back-seat passengers may brush their head against the top of the sloping down roof. However, there is plenty of leg room. The driver's seat is very comfortable, with a high-headrest, which I find very comfortable. The steering wheel feels a little short, which causes me to have to reach out to the wheel all the time. I'm still getting used to it. A big concern of mine was the newly redesigned rear window. I had test driven an Aztec and hated the bar across the rear window. It was perfectly aligned with cars behind me, essentially giving me a 120 degree rear blind-spot. The Prius, being lower to the ground, doesn't suffer from this same problem. The bar that cuts across the window is 'below' cars behind you, unless they are right on your bumper. An oddity is that the lower pane of glass in the rear hatchback is tinted darker than the upper pane. I'm not sure why this is, since the lower pane is too low for headlights to be in. The rear view mirror is large. So large that I can see the faces of both rear seat passengers and still look out the rear view window. This is a really nice effect of the oversized mirror. With backseat passengers I can now see them while talking with them rather than just hearing disembodied voices. If the HSD is the heart of the Prius, then the Navigation system is the higher-brain function. The nav system is an integral part of the entire car and is accessed through a touch-screen 8" LCD mounted in the center console of the dashboard as well as via several on-wheel control buttons. 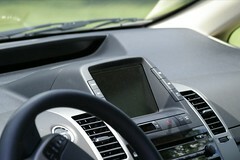 The navigation system includes maps, turn-by-turn directions, search by phone number, address, or name, POI (point of interest) icons, phone numbers, and addresses (such as Gas Stations, Restaurants - separated by American, Chinese, Italian, Thai, French, etc., Rest Areas, and so forth), and built-in bluetooth phone connection. Together this allows the drive to press the "voice command button" on the steering wheel and say "I'm Hungry" - to which the nav system responds - "displaying Restaurant Icons". The driver or passenger can then press one of these icons on the nav map, get the name and address and phone number. Call the restaurant to make reservations or check their hours, and add the restaurant to the destination list. The navigation system is DVD-based and determines location from both a GPS sensor in the dashboard as well as a magnetometer and gyroscope for vehicle orientation and wheel encoders for linear distance. This allows the nav system to determine location when a GPS signal may be incomplete or unavailable. I do wish the navigation system were expandable. For one, I would like a wireless connection for obtaining traffic and weather information. Furthermore, the ability to download or upload navigation information, waypoints, car data, etc. to a computer/handheld via the Bluetooth connection. The hardware is all there, it just falls to the software.